Muhammad Ali (born Cassius Marcellus Clay, Jr. January 17, 1942 – 3 June 2016) was an Olympic and World Champion boxer, who also had a unique personality, based on self-belief and strong religious and political convictions. In 1999, Ali was crowned “Sportsman of the Century” by Sports Illustrated. He won the World Heavyweight Boxing championship three times and won the North American Boxing Federation championship as well as an Olympic gold medal. Ali was born in Louisville, Kentucky in 1942. He was named after his father, Cassius Marcellus Clay, Sr., (who was named after the 19th-century abolitionist and politician Cassius Clay). Ali would later change his name after joining the Nation of Islam. 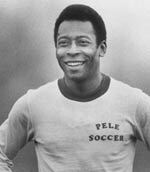 He subsequently converted to Sunni Islam in 1975. Standing at 6’3″ (1.91 m), Ali had a highly unorthodox style for a heavyweight boxer. Rather than the normal boxing style of carrying the hands high to defend the face, he instead relied on his quick feet and ability to avoid a punch. In Louisville, October 29, 1960, Cassius Clay won his first professional fight. He won a six-round decision over Tunney Hunsaker, who was the police chief of Fayetteville, West Virginia. From 1960 to 1963, the young fighter amassed a record of 19-0, with 15 knockouts. He defeated such boxers as Tony Esperti, Jim Robinson, Donnie Fleeman, Alonzo Johnson, George Logan, Willi Besmanoff, Lamar Clark (who had won his previous 40 bouts by knockout), Doug Jones, and Henry Cooper. Among Clay’s victories were versus Sonny Banks (who knocked him down during the bout), Alejandro Lavorante, and the aged Archie Moore (a boxing legend who had fought over 200 previous fights, and who had been Clay’s trainer prior to Angelo Dundee). Clay won a disputed 10 round decision over Doug Jones, who, despite being lighter than Clay, staggered Clay as soon as the fight started with a right hand, and beat Clay to the punch continually during the fight. The fight was named “Fight of the Year” for 1963. Clay’s next fight was against Henry Cooper, who knocked Clay down with a left hook near the end of the fourth round. The fight was stopped in the 5th round due to a deep cut on Cooper’s face. This was a typical buildup for Ali, who increasingly enjoyed playing to the crowd and creating a buzz before a fight. It was good news for fight promoters, who saw increased interest in any fight involving the bashful Ali. 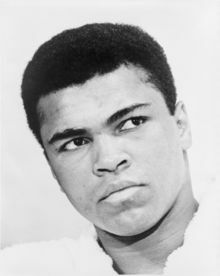 Ali refused to respond to his name being read out as Cassius Clay, stating, as instructed by his mentors from the Nation of Islam, that Clay was the name given to his slave ancestors by the white man. By refusing to respond to this name, Ali’s personal life was filled with controversy. Ali was essentially banned from fighting in the United States and forced to accept bouts abroad for most of 1966. From his rematch with Liston in May 1965, to his final defence against Zora Folley in March 1967, he defended his title nine times. Few other heavyweight champions in history have fought so much in such a short period. Ali was scheduled to fight WBA champion Ernie Terrell in a unification bout in Toronto on March 29, 1966, but Terrell backed out and Ali won a 15-round decision against substitute opponent George Chuvalo. He then went to England and defeated Henry Cooper and Brian London by stoppage on cuts. Ali’s next defence was against German southpaw Karl Mildenberger, the first German to fight for the title since Max Schmeling. In one of the tougher fights of his life, Ali stopped his opponent in round 12. Ali returned to the United States in November 1966 to fight Cleveland “Big Cat” Williams in the Houston Astrodome. A year and a half before the fight, Williams had been shot in the stomach at point-blank range by a Texas policeman. As a result, Williams went into the fight missing one kidney, 10 feet of his small intestine, and with a shrivelled left leg from nerve damage from the bullet. Ali beat Williams in three rounds. Ali’s actions in refusing military service and aligning himself with the Nation of Islam made him a lightning rod for controversy, turning the outspoken but popular former champion into one of that era’s most recognisable and controversial figures. Appearing at rallies with Nation of Islam leader Elijah Muhammad and declaring his allegiance to him at a time when mainstream America viewed them with suspicion — if not outright hostility — made Ali a target of outrage, and suspicion as well. Ali seemed at times to even provoke such reactions, with viewpoints that wavered from support for civil rights to outright support of separatism. Near the end of 1967, Ali was stripped of his title by the professional boxing commission and would not be allowed to fight professionally for more than three years. He was also convicted for refusing induction into the army and sentenced to five years in prison. Over the course of those years in exile, Ali fought to appeal his conviction. He stayed in the public spotlight and supported himself by giving speeches primarily at rallies on college campuses that opposed the Vietnam War. In 1970, Ali was allowed to fight again, and in late 1971 the Supreme Court reversed his conviction. In 1970, Ali was finally able to get a boxing license. With the help of a State Senator, he was granted a license to box in Georgia because it was the only state in America without a boxing commission. In October 1970, he returned to stop Jerry Quarry on a cut after three rounds. Shortly after the Quarry fight, the New York State Supreme Court ruled that Ali was unjustly denied a boxing license. Once again able to fight in New York, he fought Oscar Bonavena at Madison Square Garden in December 1970. After a tough 14 rounds, Ali stopped Bonavena in the 15th, paving the way for a title fight against Joe Frazier. Ali and Frazier fought each other on March 8, 1971, at Madison Square Garden. The fight, known as ‘”The Fight of the Century”, was one of the most eagerly anticipated bouts of all time and remains one of the most famous. It featured two skilled, undefeated fighters, both of whom had reasonable claims to the heavyweight crown. The fight lived up to the hype, and Frazier punctuated his victory by flooring Ali with a hard left hook in the 15th and final round and won on points. Frank Sinatra — unable to acquire a ringside seat — took photos of the match for Life Magazine. Legendary boxing announcer Don Dunphy and actor and boxing aficionado Burt Lancaster called the action for the broadcast, which reached millions of people. Frazier eventually won the fight and retained the title with a unanimous decision, dealing Ali his first professional loss. Despite an impressive performance, Ali may have still been suffering from the effects of “ring rust” due to his long layoff. In 1973, after a string of victories over the top Heavyweight opposition in a campaign to force a rematch with Frazier, Ali split two bouts with Ken Norton (in the bout that Ali lost to Norton, Ali suffered a broken jaw). In 1974, Ali gained a match with champion George Foreman. The fight took place in Zaire (the Congo) – Ali wanted the fight to be there to help give an economic boost to this part of Africa. The pre-match hype was as great as ever. Against the odds, Ali won the rematch in the eighth round. Ali had adopted a strategy of wearing Foreman down though absorbing punches on the ropes – a strategy later termed – rope a dope. – Ali before Frazer fight. 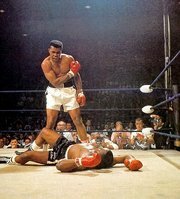 The fight lasted 14 rounds, with Ali finally proving victorious in the testing African heat. Ali was diagnosed with Parkinson’s disease in the early 1980s, following which his motor functions began a slow decline. 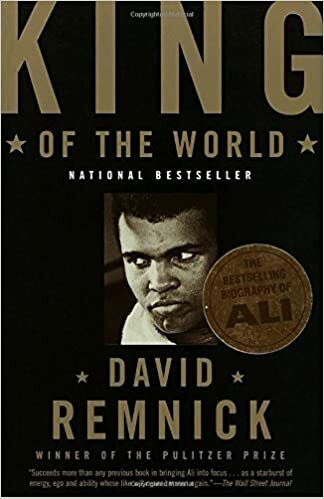 Although Ali’s doctors disagreed during the 1980s and 1990s about whether his symptoms were caused by boxing and whether or not his condition was degenerative, he was ultimately diagnosed with Pugilistic Parkinson’s syndrome. By late 2005 it was reported that Ali’s condition was notably worsening. According to the documentary ‘When We Were Kings’ when Ali was asked about whether he has any regrets about boxing due to his disability, he responded that if he didn’t box he would still be a painter in Louisville, Kentucky. Speaking of his own Parkinson’s disease, Ali remarks how it has helped him to look at life in a different perspective. Despite the disability, he remained a beloved and active public figure. Recently he was voted into Forbes Celebrity 100 coming in at number 13 behind Donald Trump. In 1985, he served as a guest referee at the inaugural WrestleMania event. In 1987 he was selected by the California Bicentennial Foundation for the U.S. Constitution to personify the vitality of the U.S. Constitution and Bill of Rights in various high profile activities. Ali rode on a float at the 1988 Tournament of Roses Parade, launching the U.S. Constitution’s 200th birthday commemoration. 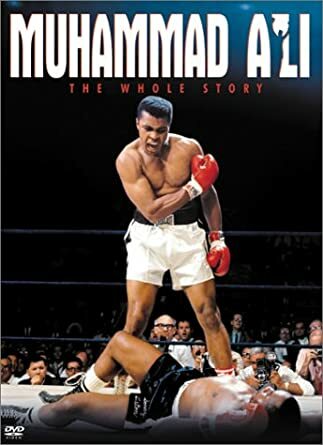 He also published an oral history, Muhammad Ali: His Life and Times with Thomas Hauser, in 1991. Ali received a Spirit of America Award calling him the most recognised American in the world. In 1996, he had the honour of lighting the flame at the 1996 Summer Olympics in Atlanta, Georgia. On September 13, 1999, Ali was named “Kentucky Athlete of the Century” by the Kentucky Athletic Hall of Fame in ceremonies at the Galt House East. In 2001, a biographical film, entitled Ali, was made, with Will Smith starring as Ali. The film received mixed reviews, with the positives generally attributed to the acting, as Smith and supporting actor Jon Voight earned Academy Award nominations. Prior to making the Ali movie, Will Smith had continually rejected the role of Ali until Muhammad Ali personally requested that he accept the role. According to Smith, the first thing Ali said about the subject to Smith was: “You ain’t pretty enough to play me”. He received the Presidential Medal of Freedom at a White House ceremony on November 9, 2005, and the prestigious “Otto Hahn peace medal in Gold” of the United Nations Association of Germany (DGVN) in Berlin for his work with the US civil rights movement and the United Nations (December 17, 2005). On November 19, 2005 (Ali’s 19th wedding anniversary), the $60 million non-profit Muhammad Ali Center opened in downtown Louisville, Kentucky. In addition to displaying his boxing memorabilia, the centre focuses on core themes of peace, social responsibility, respect, and personal growth. Americans – Great Americans from the Founding Fathers to modern civil rights activists. Including presidents, authors, musicians, entrepreneurs and businessmen. Featuring Thomas Jefferson, Abraham Lincoln, Madonna, Oprah Winfrey.